Fathers day craft projects are a great way to show dad that you care without spending a lot of money. 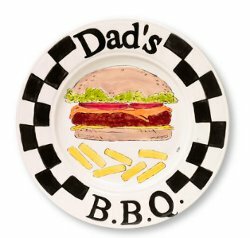 This great customizable father's day BBQ plate from I Love to Create is something that Dad can really use! We know he'll appreciate it! Clean greenware and fire to shelf cone 04. Transfer BBQ plate pattern to ware. Apply two coats of CN 281 Light Brown to bun using the SB 806 No 6 Round. Using a sponge, apply one coat of CN 181 Light Kiwi to color the lettuce. Add accents with sponge and CN 182 Bright Kiwi. Sponge hamburger with CN 232 Bright Briarwood to add depth of color. Apply one coat of CN 042 Bright Papaya to cheese with Round. Use the SB 802 No 1 Liner loaded with CN 021 Light Saffron to mustard. Use the Round to apply same color to french fries. The tomatoes are colored using CN 073 Dark Scarlet. Paint one coat with the Liner. Detail hamburger and fries with CN 253 Dark Black and the SB 802 No 1 Liner. Using a pencil, write text on the rim of the plate. Use the SB 806 No 6 Round and CN 253 Dark Black for lettering two coats. The checks on the rim are also done with the same color and brush. Let dry and dip piece in CN 2000D Clear Dipping. Let dry, stilt, and fire to shelf cone 06.